It’s time to share this month’s Pure Innocence releases with My Favorite Things! Today we have EMT Boy, EMT Girl, Picture Perfect, Loads of Love and Piggy Bank. Today I chose to use super-duper cute Loads of Love. 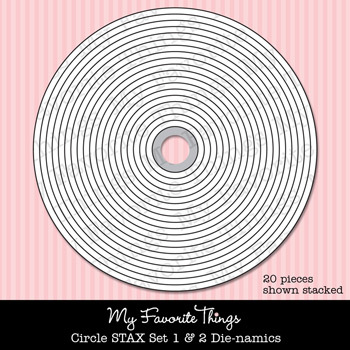 I also used Circle STAX, Fishtail Flag STAX and Faux Crochet Border Die-namics. After coloring with Copics, I pieced the dress, then also pieced the apron, attaching the waist to the dotted paper and placing a foam dot beneath the bottom edge. I finished the inside simply (as usual). You can attend the New Release Party on August 7th from 8-10 PM EST here in the MFT forum where you can enjoy fun, games and PRIZES! 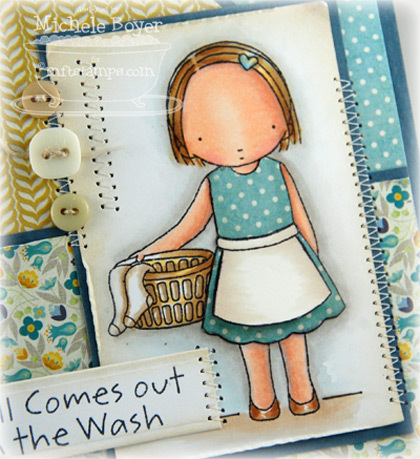 The MFT release, including all new stamp sets and Die-namics, will take place August 7th at 10 p.m. EST. You’ll find all the newest products here at release time. 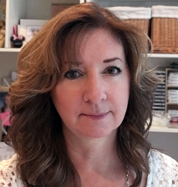 The guest designer contest is ON! Check out the forum for details on how YOU can win over $200 in stamp sets and Die-namics and play along with the MFT Design Team for a month. Teaser prizes continue so be sure to leave comments as you look! You can find direct links to all participating DT HERE. Each day, two prize vouchers are held by two members of our design team. You’ll have all week to comment on each of the posts and all winners will be posted on Kim’s blog on Tuesday, August 7th around 7:30pm. Stamps: MFT “Loads of Love” (Pure Innocence) Ink: Memento Tuxedo Black; VersaMagic Wheat and Aegean Blue Paper: Prism Mystic Medium, X Press It Blending Card, My Mind’s Eye The Sweetest Things “Bluebell” (6×6) Accessories: Copic markers (E00, E11, BV000, R20, Y21, E40, E41, E42, W00, W1, BG70), Circle STAX, Fishtail Flag STAX and Faux Crochet Border Die-namics, buttons, jute, foam boosters. Finished size 4 1/4″ x 5 1/2″. The papers on this are gorgeous. I love the colors and paper piecing looks fabulous. All my favorites: clean laundry 🙂 anything blue and the faux crochet border!! Super~De~Duper!!! Very sweet, love this image. Fabulous details. Love the dp and how you layered the apron. What a wonderful card. Love the image, paper, coloring and design. Saving to CASE the design. Thank you! This is so very pretty! Love her little polka dot dress! lovely card, Michele, beautiful colour combination! So adorable! Love the layout and papers! Sooo pretty and perfect papers with her! I just love the papers and colours on here! Awesome card Michele!! 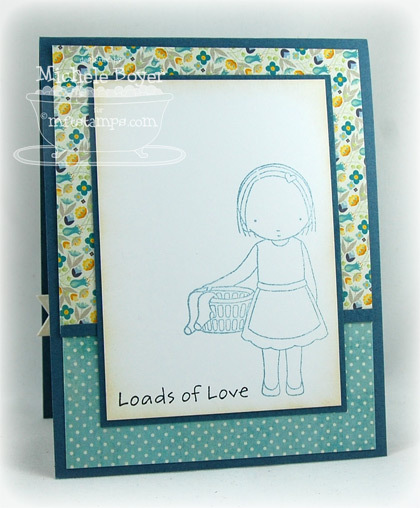 Super sweet – love the blues and yellows! Wow your coloring is perfect! And that stitching! Ack! Who doesn’t love laundry? Sweet card, I love these stamps. Oh this is so beautiful!!!! The blues are just gorgeous!! I think this is my favorite of the PIs this month!!! Beautiful card. Really love this layout. Michele, oh my goodness this is absolutey amazing! You have totally out done yoursef today! LOVE the design, LOVE the papers, LOVE the colour combo, LOVE your colouring, LOVE the stitching! AMAZING Michele!! GORGEOUS!! Love this DP!! Her paper pieced dress is SO cute!! Great job!! Beautiful card. Love the papers and your design. When I get this paper and this PI, I am totally casing your card!!!! Very cute card! Love the innocence girl! It is super cute! And I like the combination of patterned papers! Oh.My.Word. OK, first off, I WISH my MME was here, because these papers are GORGEOUS, but seriously, could your coloring be any more gorgeous? I think not!! !